This item had been promised earlier this year, so I was interested to check it out. The download is a file named RefreshWindowsTool.exe that is a miniscule 343 KB in size. It turns around and downloads a copy of a Windows image file (.wim) of its choosing (3.4 GB for the 64-bit version that most PCs use). The tool performs a clean install of Windows 10. Thus, all applications installed atop the OS must be reinstalled to be available. A working Internet connection must also be available to grab a Windows image. The tool supports only three language versions: English (EN-US), Chinese (ZH-CN), and Japanese (JA-JP). MS indicates that “digital licenses, digital content associated with applications, or other digital entitlements for applications” may not survive the fresh start process. This would either make those applications unusable, or the content unavailable. MS recommends that the tool be avoided on PCs where such applications or content are in use. My hope is that all these dangling issues and gotchas will be fixed by the time the Anniversary Update goes out the door in mid-to-late July, 2016. 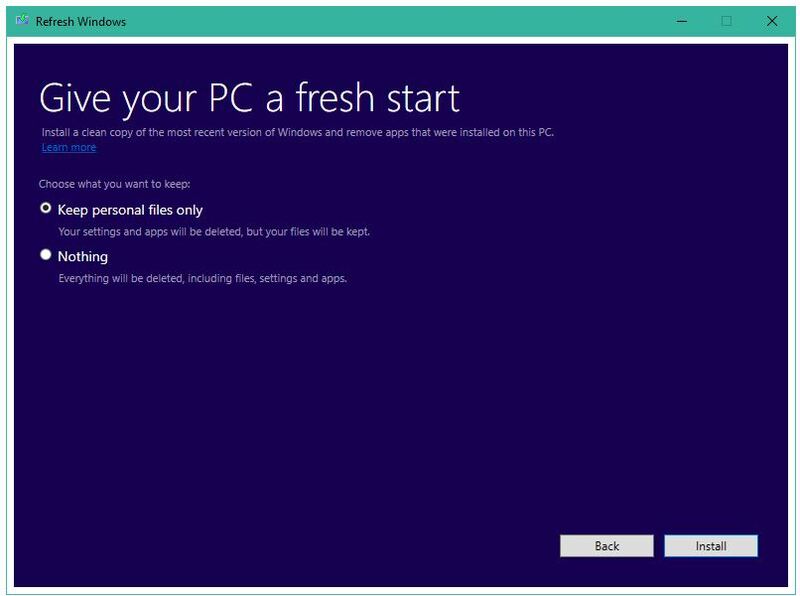 If so, admins and users can put the Windows 10 Fresh Start Tool to work without fear of license or digital entitlement issues. Perhaps more useful would be a Windows10 roll-back tool for all the dissatisfied adopters who've found it runs like a one-legged dog on their older hardware?